Happiness: Discovering that Guerlain have opened a brand new “concept” pop-up store on the Champs Elysees. Ecstasy: Discovering that you’ve been invited along to the brand new Guerlain concept pop-up store on the Champs Elysees for an exclusive look around! So now you finally know why we were there … This was definitely the highlight of the trip Hilda and I made recently – and it didn’t even involve any food! 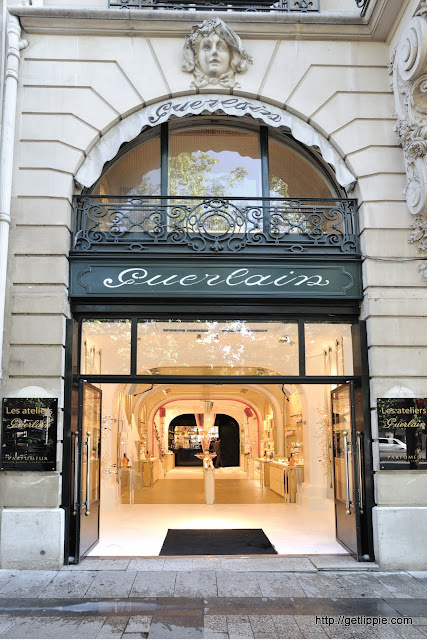 Situated next to the original Guerlain store which dates back to 1914, Guerlain have created a modern haven of light and colour, designed to replicate a “workshop” atmosphere, luring passing shoppers into sniffing, swatching, and just plain playing with products to their heart’s desire. 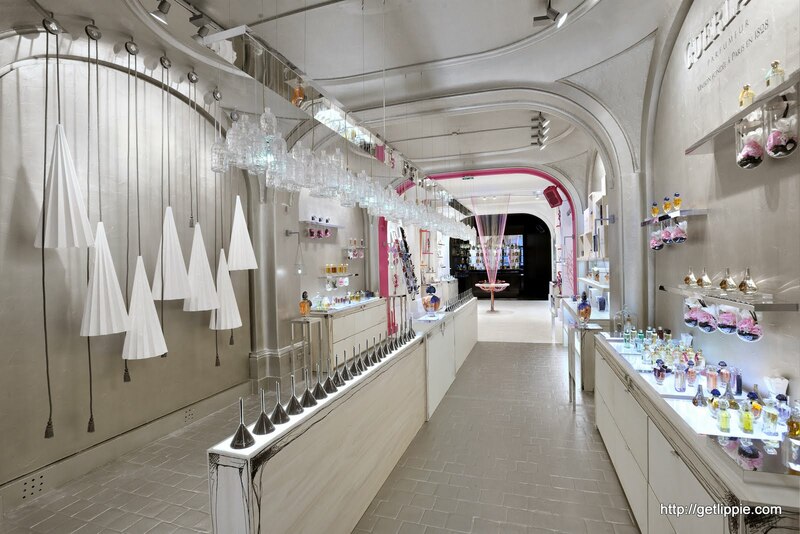 On top of the divider in the aisle there, are funnels scented with many of the Guerlain fragrances. This is a great idea that we saw in a couple of perfume stores, and it allows you to pick up the fragrance and smell it without having to spray or get scents cross-contaminated on your skin. The “chandeliers” you see above the divider are actually made of empty Guerlain scent bottles, and are very beautiful as a result. I spent a lot of time around this area. 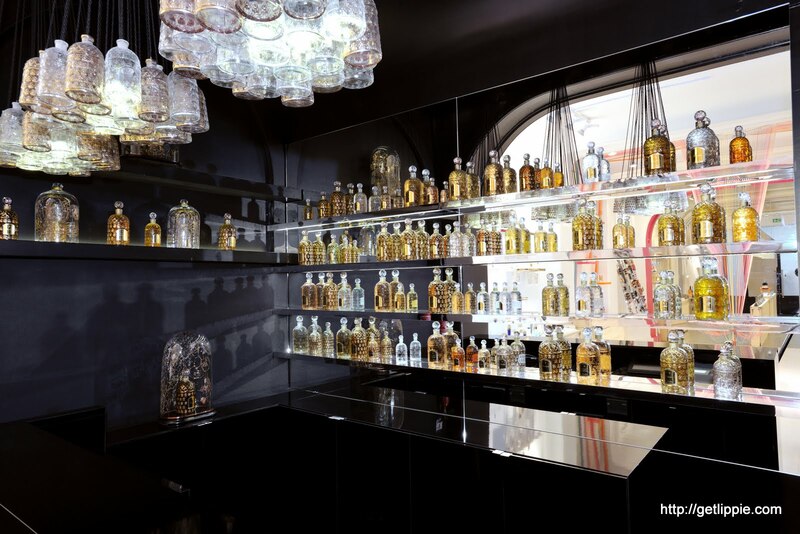 To the right there is a display of the more widely available Guerlain scents such as you’d find in any department store, and further back on the left are the rarer, and harder to track down scents. Here, I finally managed to smell Derby, and Vetiver Pour Elle – amongst others – and cross them off my Project Perfume list. I managed to resist – just – buying Vetiver Pour Elle, discovering that I prefer the more sparkling scent of the original Guerlain Vetiver. Which is nice, as it’s just saved MrLippie the trouble (and expense!) of buying me a bottle! 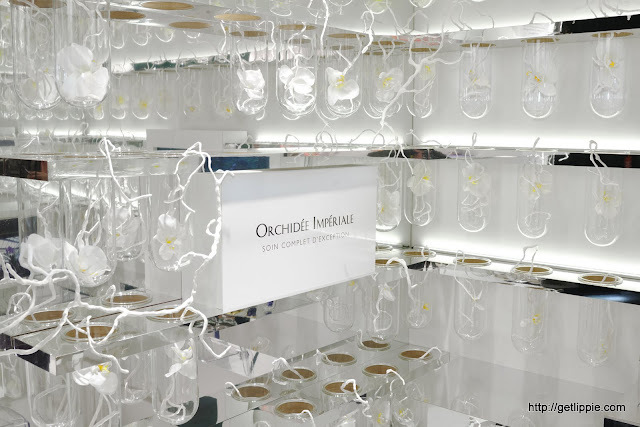 Here there are samples of every cosmetic Guerlain produce, and you’re free to sample and swatch as much as you like, there’s even a “kisses tree” next to the mirror (and what blogger can resist a mirror with lights in the shape of lips? Not this one!) where you can place your lipsticked kisses to decorate the store. This was just too cute! In the middle with the multicoloured yarns is a display of all the shades of Rouge Automatique lipsticks that have been released. I love these lipsticks, but whilst not a fan of the packaging, it was nice to see a range of lipsticks produced this year that aren’t all sheer … I swatched a lot of them. Well, you would, wouldn’t you? Paris was celebrating the launch of Shalimar Parfum Initial whilst we were there, which is an unexpectedly pink and unashamedly fresh addition to the range of Shalimar perfumes, we were presented with a bottle at the end of our tour, and I’ll be reviewing it alongside my three (count them!) other versions of the scent very soon. First thoughts are: that it might be pink, but it’s not fruity, and that alone has made me very happy. Orchids are central to a lot of what Guerlain do, their extracts being used in a lot of their skincare products, and of course, the most famous orchid extract of all – vanilla – is central to very many of their perfumes. A gorgeous collection of Guerlain’s famous “bee bottles” containing various fragrances and featuring more of those beautiful chandeliers. The bee was the emblem of the Napoleon family, and Guerlain were given a warrant to provide the Emperor’s homes with perfumes, fragrances and toiletries, which gave them the right to display the heraldic bee on their products. I own a few bee bottles already – mainly via the Aqua Allegorica fragrances – and it was lovely to see so many of them from throughout the ages on display. If you’re in Paris this summer, head to the Champs Elysees, and see the store for yourself. You won’t regret it! The Fine Print: Get Lippie and Beauty Mouth attended the store as guests of Guerlain, but the store is open to anyone, and the staff (security guards aside) are very friendly and helpful, and happy to chat about the products. No credit cards were harmed in this store. The Other Fine Print: all pictures bar the starburst are featured courtesy of Guerlain. Please don’t copy without permission, thank you. The Other, Other Fine Print: Get Lippie and Beauty Mouth wish to extend their grateful thanks for the gracious hospitality shown on this trip by both Guerlain UK and Guerlain FR. And to FHM for the booze on the way home. Long story, but Amanda, you rule. The Other, Other, Other Fine Print: You know if you type “other” often enough, it looks really weird? It’s okay, I’m done now. Please leave a comment, it always makes me feel like I’m talking to myself otherwise. I am though, aren’t I? Helllllooooo?? Next Post Get Lippie’s Lippie! I just broke out into a very light sweat reading this. 1. I can't wait to hear your thoughts on Shalimar Parfum Initial. But you probably already knew that. 2. Did you test any of the Orchidee skin care products in-store? I've wondered about them, and if they really are that luxurious (or at least that cosmetically elegant). Great pictures, interesting experience – thank you for sharing. So beautiful, I am so envious of your opportunity. 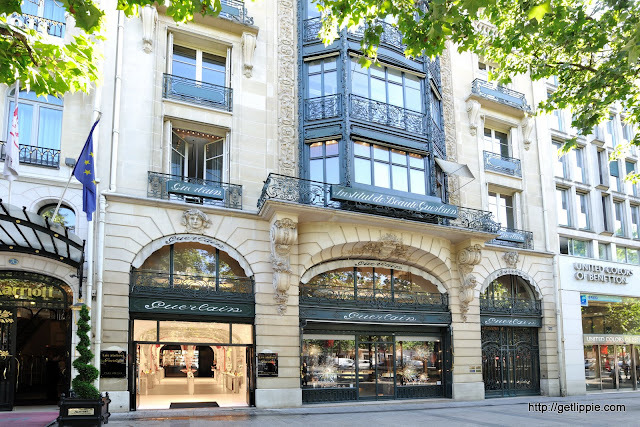 I have only had contact with Guerlain in department stores and adore them. Wearing their perfume right now,actually. That looks beyond amazing, thanks for sharing. 18 year old daughter off to Paris end of june for the shows so have sent this link to her in the hope she can visit Guerlain! Sigh …. Cool! Has inspired to go and put a spray of Vetiver pour Elle on from my quickly diminishing 2ml sample. And I'm a boy. Wow, just wow! I could spend a veritable age in there. Thanks for the sharing your visit, it was a real treat! This looks like a little bit of heaven. Can I say also, you really got lovely photography of the store too.